According to Berni | LIVE life, LAUGH alot (even at yourself) and LOVE like there’s no tomorrow. LIVE life, LAUGH alot (even at yourself) and LOVE like there’s no tomorrow. Well my friends, the Techno Challenged girl that I am, finally made the plunge…. to self hosted that is!! You may also need to change your Google Reader and/or Blogrolls. This story could have been told differently… I could put up a post about how awesome the 60 mile Tour de Palm Springs ride went…. leaving out details and painting a nice pretty picture. I didn’t finish the ride. The weather could not have been any better if I would have special ordered it and I had the best day regardless of the outcome!! The day started out not so bright and early…5:00am we headed out in the dark to the start line where we parked and had breakfast. Our start was at 8:00am and I heard the announcement saying there was 10,000 riders this year!! Wowie!! Nothing like a long bike ride with 10,000 of your closest friends! We conquered the hills in the first 10 miles with no problem. At the first SAG stop (mile 18) I was still feeling strong. Then somewhere around mile 25 the lactic acid in my legs was getting pretty bad. My sit bones were also screaming…. something about the new seat they were sitting on, they were not getting along! Great….. The second SAG stop was at mile 32 and it was there I decided it wasn’t fun anymore and I informed sister that I would probably not make it the 60 miles… but she was still feeling really good so she was not going to hop the shuttle with me. I thought I could make it to the next stop so we headed out… these next 12 miles were all about survival and I seriously was in pain. I stopped every 4-5 miles and by the time I got to the shuttle I thought I’d either cry or throw up!! I jumped on that shuttle and was never happier to be off my bike. 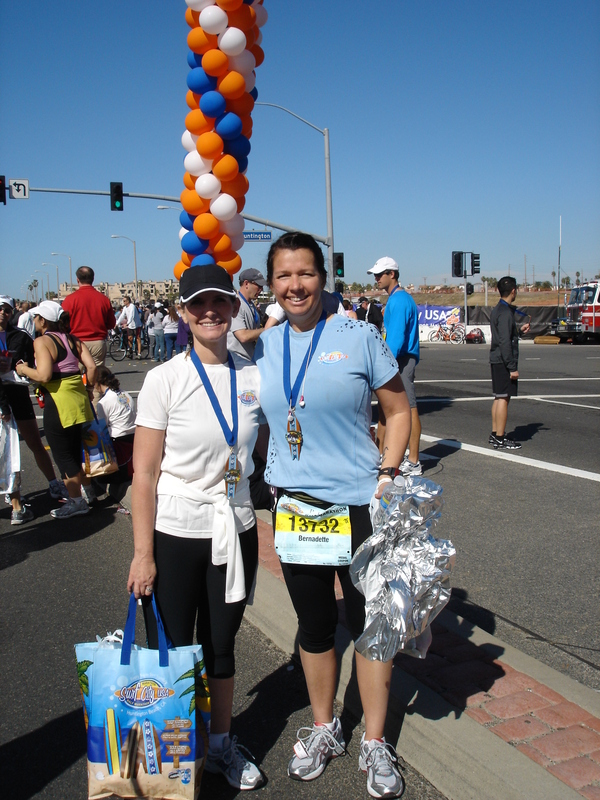 It took about 45 min before we arrived at the finish line… and by then my legs were starting to calm down. I made it there to see sister cross the finish line and was never more proud of that girl! Looking back there are probably a few reasons I was not able to finish, none of them alone would have done it but all of them together spelled trouble. I had just ran a Half Marathon 6 days prior. all in all, I had done the ride before and after just coming off of my Half Marathon high I was just out there for fun which is why I decided that when it stopped being fun I was tapping out…. Here are some pictures of day in the sun!! It’s funny how much these two completely different things have in common…but having experienced BOTH I couldn’t help but compare the two. Childbirth and running a half marathon. Training for my half was like pregnancy. It was very exciting in the first few weeks, it then became routine and eventually I just wanted it to be over with! The actual running of the half was alot like labor. In the first few miles I was feeling good and extremely confident that I was prepared to conquer this thing. At about the halfway point I started getting a bit tired and pains here and there were starting to peek their evil head. Then in the last couple miles I gave it all I had to just be done with it already. Crossing the finish line is like the delivery. One of the proudest moments of my entire life. Nothing can compare to the joy you feel but you are pretty sure you don’t want to do that again. 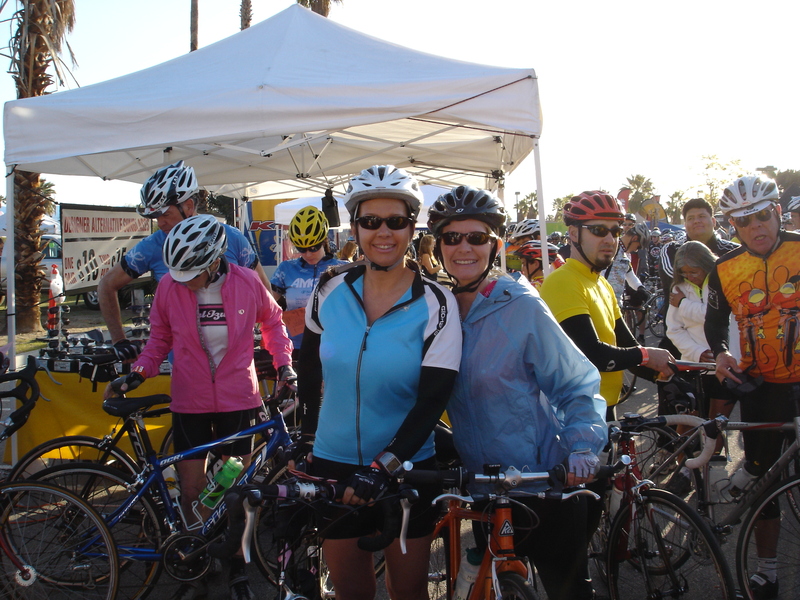 This weekend I will be riding in the Tour de Palm Springs for the 3rd year in a row. 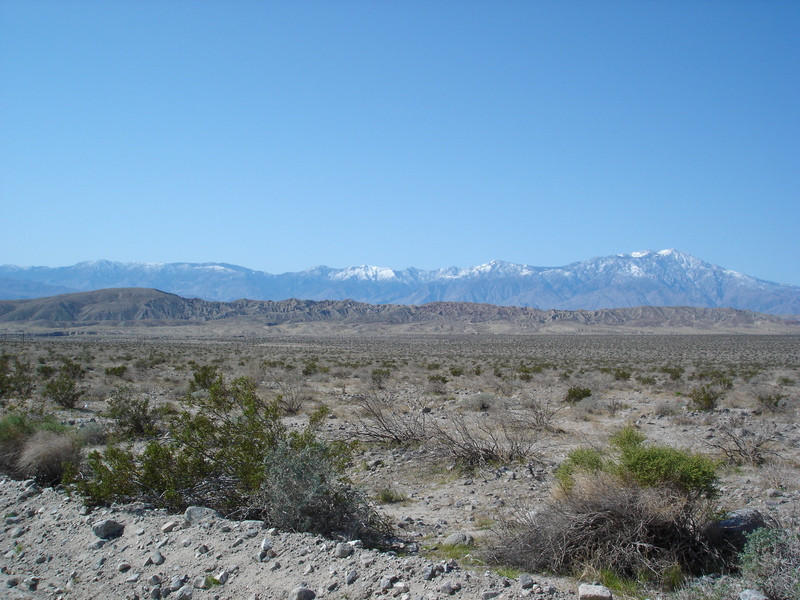 It is a Century and a Metric Century ride thru the beautiful Southern California desert surrounding Palm Springs. The very 1st year we did the Metric and had amazing weather. The 2nd year we did 73 out of 100 miles and had the coldest HARDEST wind I’ve ever seen in my life~! This year we decided that because we just ran a Half last weekend we should probably do the Metric again and that’s what we will be doing … 60 miles of bliss!!! Cycling is my first love and I am SO excited to be back in the saddle tomorrow!! We are supposed to have great weather in the low 80’s! I hope you all have a WONDERFUL weekend and a Happy Valentines Day!! The day started out bright and early, I stayed the night at my sisters house (all the kids stayed at my house) and we were able to get a good night sleep and an early start without having to do the Kiddie shuffle…. We had to park about 3 miles from the start line and take a shuttle over- there were ALOT of people there! But we made it and were off and running! I had doubled up on shirts, short sleeve with a long sleeve over it because it was COLD!!! So at about mile 2.5 I was warm and I took off my long sleeve shirt and tied it around my waist. At mile 3 ish I realized the dates I had in the little pocket on my water bottle were GONE!! Oh NOOOOOOOOOO, not my dates!! I think they fell out when I was doing my presto change-O while running…. my plan was to eat a couple of them at the half way mark. I felt best from mile 3 to mile 9, I found a good rhythm and held a good pace and was feeling really good. At mile 8 we turned back onto Pacific Coast Hwy and ran the last 5 miles along the coast. It was a beautiful day, blue skies and cool air. The sun was in our eyes at this point but it was an awesome way to finish the race. Mile 9 is where I started to feel the blister forming on my 2nd toe on my right foot. By mile 11 it was getting really big and I could feel it squish with every step. I kept wondering if it would pop and offer some relief or major pain but I kept putting one foot in front of the other and was never happier to see a finish line in my life!!! I had my nephews Flip video camera with me and made this video… I apologize for the un-steady hand but I wasn’t about to stop and video along the way so I did it while running… the quality isn’t great after I transferred to Youtube but at least you can see how much fun I was having!! 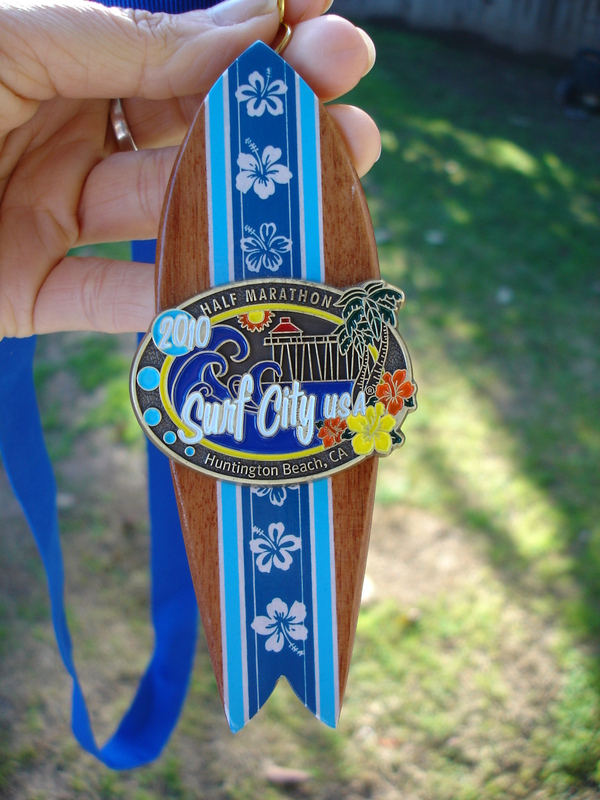 and look at the adorable finisher medal we got! I couldn’t be happier with the whole experience!!! It was an awesome first Half Marathon! I was pretty sore for the rest of the day and am a bit better today but still sore. We are already making plans to do another one, probably in the fall!! Thank you all for showing me soooo much support and love!! I had every one of you in my mind along that course and just knowing that you were all cheering me on was enough to keep me going…every step of the way!! I ran my very 1st Half Marathon!!! What an amazing acomplishment, I cannot tell you how amazing it feels to know I ran, I ran well and crossed that finish line with a BIG smile on my face. I couldn’t have done it without all the support of my bloggie friends, that’s for certain. The kind words and cheering section you all provided was what kept me putting one foot in front of the other for parts of todays race. I finished in 2:33 I had set a goal of 2:30 and came ‘this close’ to making that goal. I really thought that I made my goal when I crossed the line, my garmin time was 2:34 but I forgot to stop it for a bit and chugged a bottle of water. Oh well, I’m happy with the 2:33 time and will most certainly take it. I have some pictures and videos to post and will do that later today or tomorrow with a complete race report…for now I have a blister that needs tending to and I feel the need for a nap!! SURF CITY HALF MARATHON here I come!!! The weekend has finally arrived. You know the one. It’s the weekend I will be running my very 1st Half Marathon!!! I’m not afraid of alot but one thing I do fear is the UNKNOWN. Which would explain the butterflies that feel like they are trying to tear their way out of my stomach! I keep telling myself that “I CAN DO THIS” and really I know that I can but I’m still nervous. After 15 weeks of training and even more time mentally preparing, I have done two 10 mile runs. One felt great, one not so much. Looking back at the training I think it was an OK plan, but I have already been thinking of ways to tweak it a bit to get more out of it. Yep you guessed it, there WILL be another one. I kind of have that mentality of “if one is good, two is better” so sometime around the Fall I will plan for another Half. My sister and I run on the riverbed trail every Sunday morning for our long runs. Every Sunday we see this woman running, we see her on our return trip so she is always running toward us and we always say HI. Last weekend I asked her as we ran by if she would be at Surf City and she said YES. I wonder if we’ll see her there… I just found it interesting, like ‘running’ is the ‘shoelace’ that ties us all together. Tapering is hard mentally, I find that I have the urge to go out and run or I’ll lose all that I’ve built up. I know that is not true but not running the week before a big event is as hard as I’ve heard it to be. I ran my last run yesterday, an easy peasy 2.5 miles. Then I came home and whipped up some juice!! An interesting thing I learned while training for this (from Thrive of course!) is that immediately after a hard workout you need to replace the Glycogen stores in your muscles. I always thought that I needed protein immediately after a hard workout, it turns out that should come a bit later. According to Thrive, immediately following a workout, the best snack is one that contains Simple Carbohydrates with no fats, not even good fats. This will allow you to replace the glycogen in your muscles so that it will be readily available for your next workout. The nutrient rich meal that would include protein should follow about an hour later. 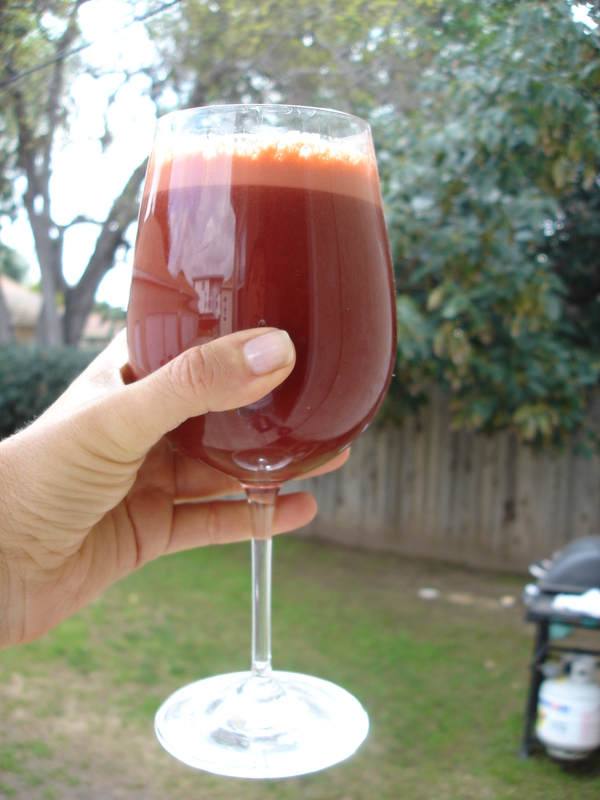 Carrot, Romaine, Beet & Apple Mmmmm good!! Have a wonderful weekend my friends, watching football, getting massages, going wine tasting, running 10 miles, whatever it is YOU will be doing this weekend… just know that you will all be with me at the beach as I run my first Half. Thank you for all of the encouragement and kind words. Holy mother of all things good, grab your britches kids we’re going for a RIDE! So, I had my post-it in hand and headed out for a regular ole trip to my favorite store Sprouts. 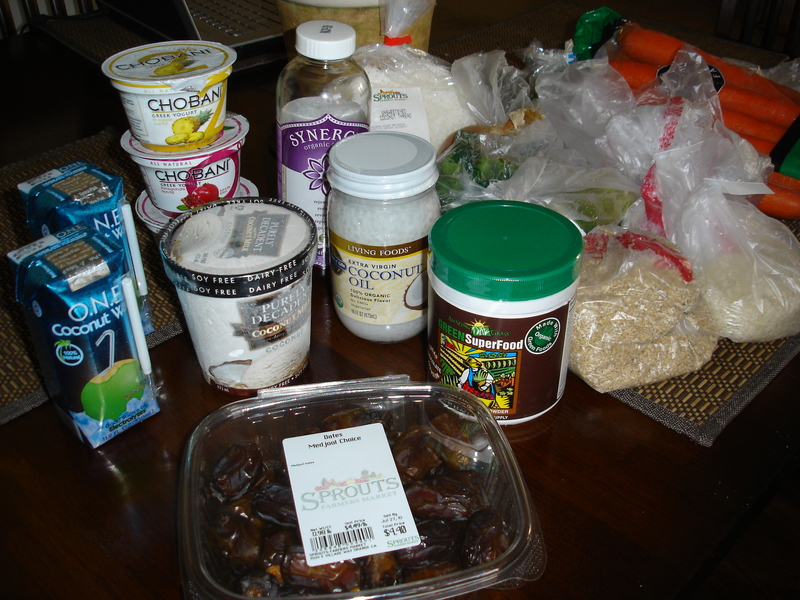 It started out as any ordinary trip would….but while I was there I struck GOLD!! My lord I feel like I’ve won the Lotto!!! First let me show you my haul, then I’ll break it down. and so it goes, I’m late getting on this bandwagon, but now that I am WHOA BABY!! After getting some advice on flavors and brands from Shari I went with the Divine Grape and was NOT dissapointed!! 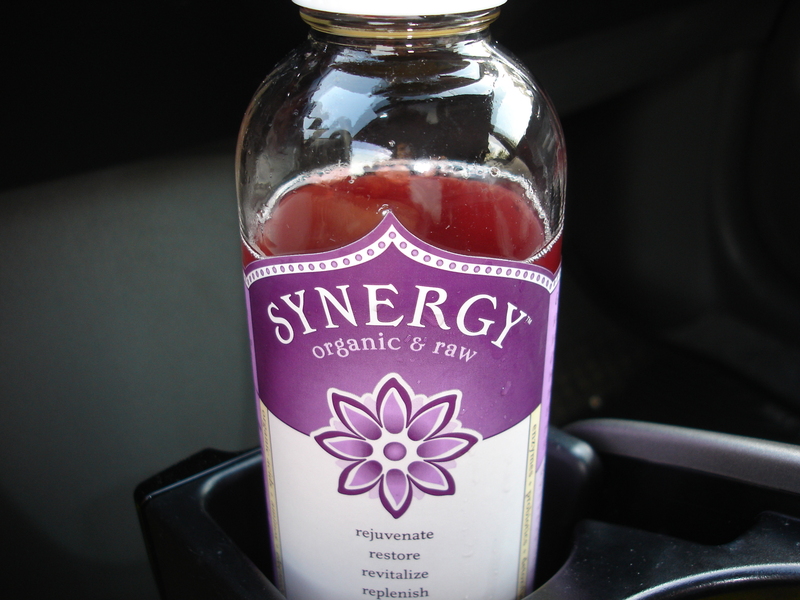 I had purchased a bottle of this stuff about 3 years ago, long before I ever heard about it. I saw some girl in Whole Foods putting about 10 of them in her cart, she looked fit and healthy and I figured she must be on to something so I bought a couple. When I got in the car I cracked it open and about gagged over the smell! Needless to say I didn’t drink it. So this time I figured I was going to try it, cracked it open, and chugged. OMG!! It is SO good, the taste is not like the smell (at least with this flavor). I drank about half the bottle on my way home and then realized it may contain alcohol!! OOOOOpsie! Does this mean I was drinking and driving??? God I hope not. Wont do that again just in case…. So why don’t you join the thousands of happy peppy people and get a great big bottle of Vitaveatyvemeanyminimoe. I’ll tell you what you have to do. You have to take a whole tablespoonful after every meal. It’s so tasty too. It’s just like candy. Amazing Grass after seeing it all over the blog world and asking this lovely lady for some advice. I debated for a while on the flavor. Original vs Chocolate. 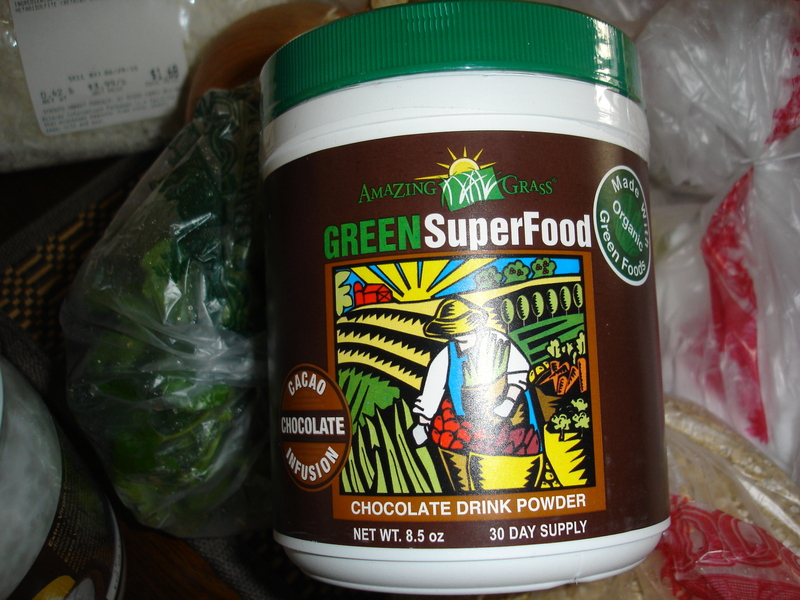 I decided to go with the chocolate because I already have a ton of green stuff that I put into my smoothies and figured I could use this to mix up a treat with either Hemp or Coconut milk and have it for a snack. COCONUT ALERT!! This my friends is BIG news, especially to my friend LUCY who may need an intervention soon. After plugging along with my Spectrum brand of coconut oil for about 3 months and not knowing I was missing out on anything…. 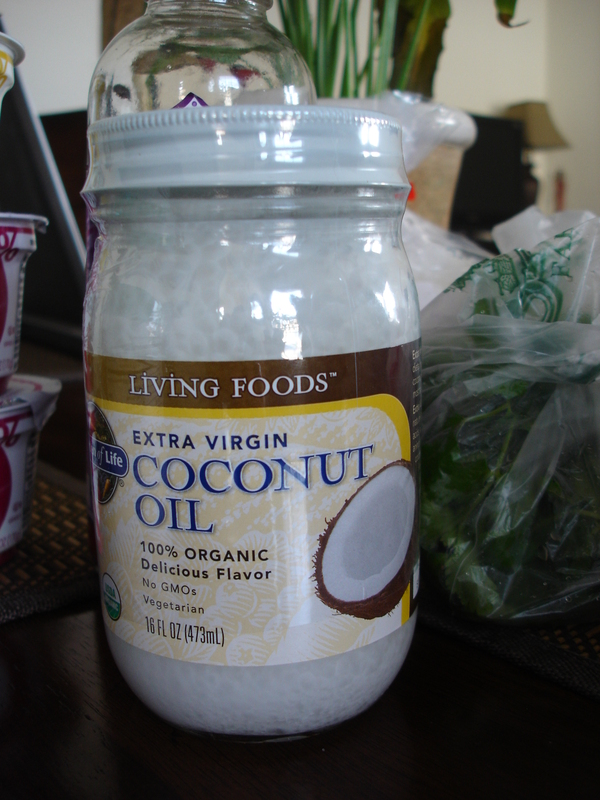 I tried the Living Foods brand and Holy Coconut Oil, there IS a difference!!!! I also picked up some fresh dates because I couldn’t remember when I bought the ones I had and apparently there IS also a difference in a fresh date and an old date (that’s what she said). I yanked out the pit, slathered on some of my coconut oil (which by the way smells divine!!) 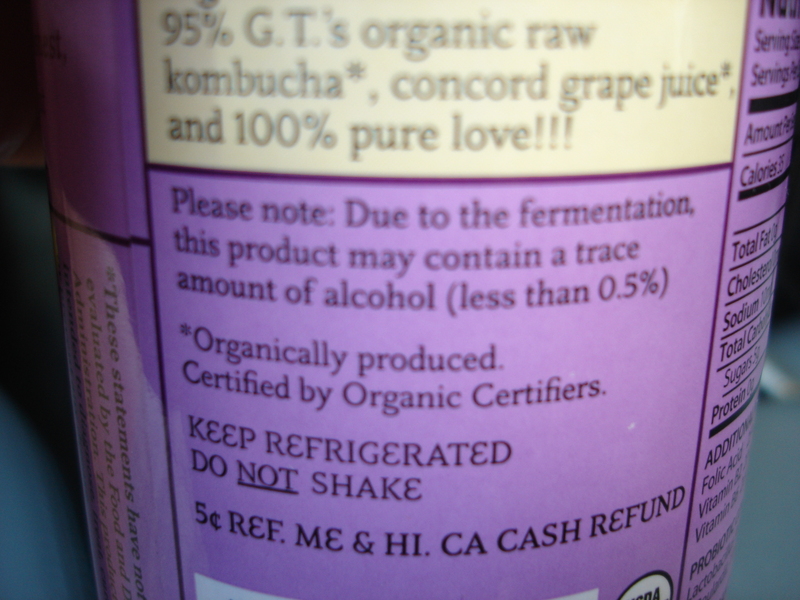 and popped it into my mouth… I’m not sure if it was the alcohol in the Kambucha or the date/coconut oil but I dropped to my knees. Great, just what I needed, another vice. Now…. I know we’re all trying to be healthy and if we lose a pound here or there, what’s the harm right? But I’m here to tell you that my new religion is MODERATION. I will preach it till I die. And for those days when our healthy food and exercise is tipping the scale just a tad too far to the left and we need that somethin’ somethin’ to balance it out…. well don’t say I didn’t warn you. The following food item may or may not be addictive. 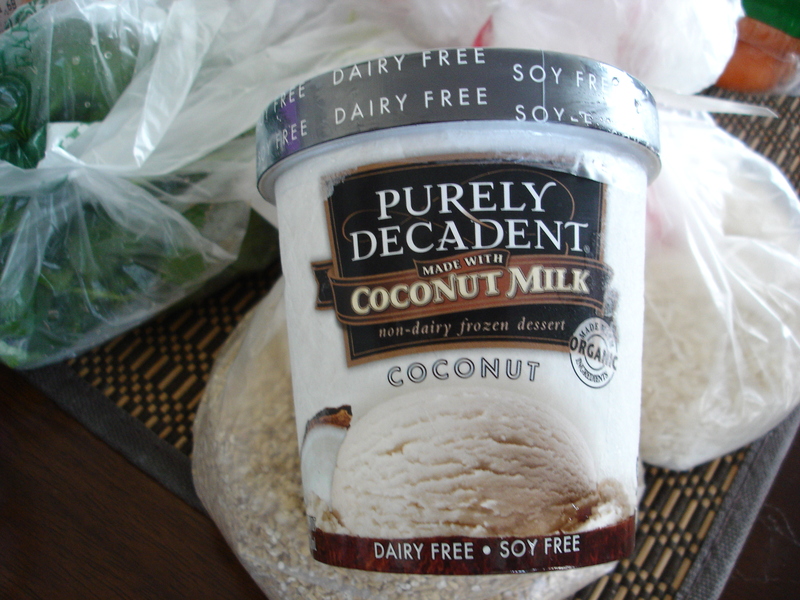 Purely Decadent.... aint no lie! I cracked this puppy open and got a spoon like I was raised to do…. but honestly, I just wanted to shove my face in it!!! This is the creamiest, coconuttiest elixir I have ever tasted in my life. I mean how is it that I’ve been eating solid foods now for over 44 years and had no idea this existed??? It’s ecstasy on a spoon. Beware.... and don't say I didn't warn you!!! 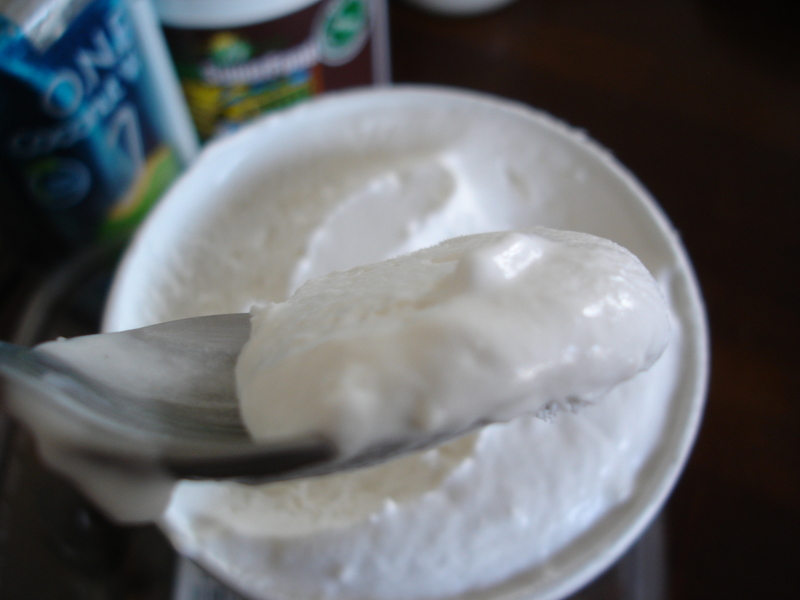 It’s creamy coconut ice-cream made with coconut milk and has little flecks of coconut in it…. I have no words. There were other flavors but I figured I’d stick with the theme of the day. I’m thinking of adding a Pay-pal button to the blog just to support my new habit. Well, tonight is The Biggest Loser so you know where I’ll be if you need me…. and if I’m not there, check the freezer!